Earlier this year, I made cupcakes with my company logo on them for a bake sale at work for our annual Bag Hunger campaign. Having fallen in love with them after I made them, and even ranking them among my best work, I decided to revisit the concept for a potluck my company pyramid is having…Only this time, I decided to make my life easier and make a whole cake with one big logo instead of putting myself through the torture of cutting little tiny b’s for God knows how many hours. I have learned that suffering for your art is good, but too much suffering only creates a cranky baker with a cramped neck. But it’s still worth it. 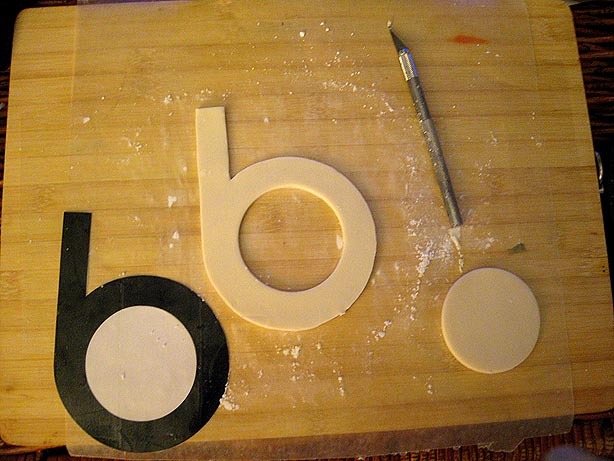 The making of the logo — I used the “Bloomingdale’s” font from the company’s installation of MS Word to print out a “b”, blown up to size 500, taped both sides of the sheet of paper with clear packing tape, just enough to cover the letter itself, cut it out and used it as a stencil to cut out a logo from fondant using my trusty Xacto knife. And I got the middle to be perfectly round by using a circle cutter that, coincidentally, was the exact size I needed. The cocoa tiramisu filling has the consistency of pudding. 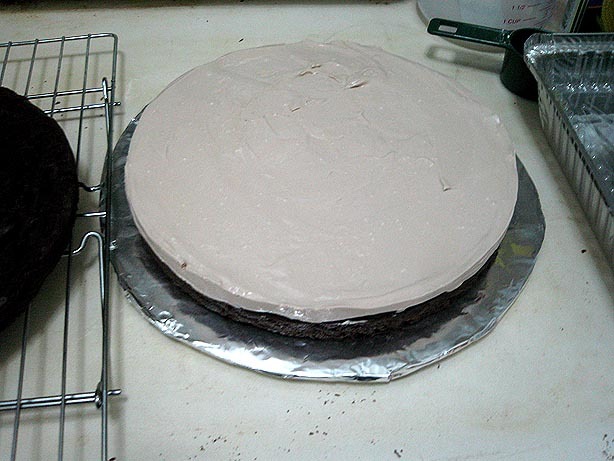 From past experience, using a filling with pudding-like consistency causes spillage over the sides when the top layer cake is put into place (ideally, you need to have a filling that can support the weight of the top layer). So I put the “frame” (as opposed to the bottom) of a spring form pan around the bottom layer, spread the pudding-like filling over it, and froze the whole thing for about half an hour, and then placed the top layer so there would be minimal spillage because the filling would be a little more solid. But wait! It didn’t get into place sans drama, my friends. These cakes, when baked and then cooled, are actually quite thin (another reason I made this into a layer cake) and very, very moist. So what happened when I lifted the top layer from the cooling rack in order to put it in place? It broke into three pieces… Come to think of it, I should have frozen the top layer too so it would be harder, therefore preventing the breaking. Oh well. Too little, too late now. But for next time, I know. 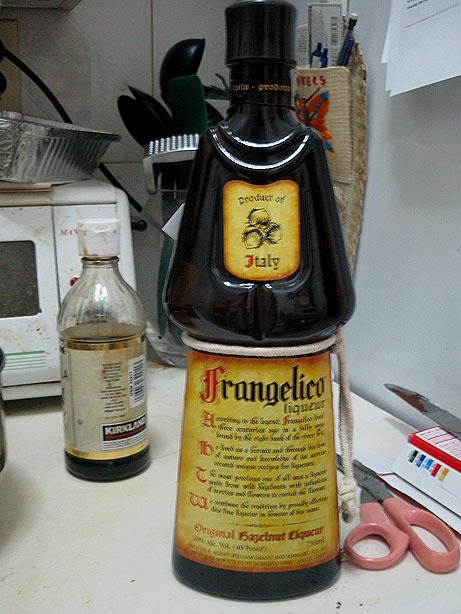 An important part of the cake recipe…though I’m not sure I could taste the hazelnut liqueur essence in the cake. After putting the whole mess together, I froze the cake — bottom, filling, and top together — again. This time for about an hour. I took the cake out while making chocolate ganache and after waiting for the ganache to cool a little, proceeded to slather it onto the cake, covering the bumps, the cracks, and all the imperfections underneath. 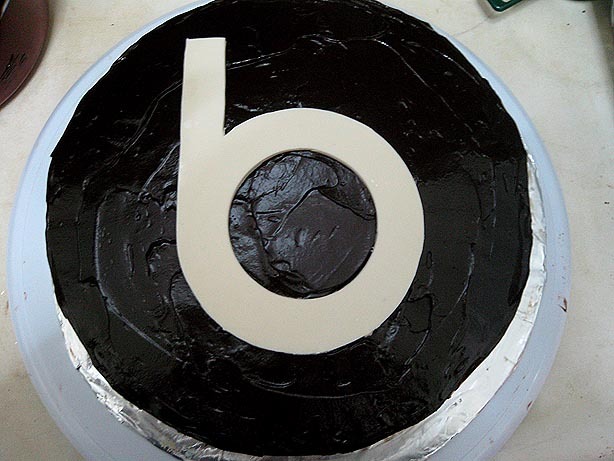 I love my cake turntable, by the way. I think spreading the ganache onto the cake with my icing spatula was the best part of this whole process. I get to smooth away the bumps and cover what’s underneath with a flourish of my ganache-bearing spatula, leaving a fairly smooth, shiny surface with no one the wiser about the cracked cake. 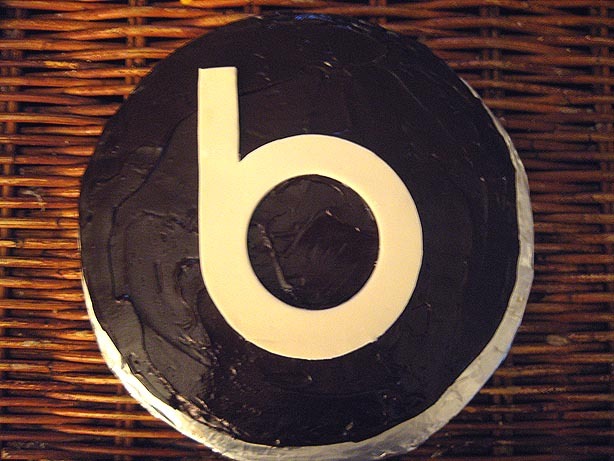 The final touch, of course, was the “b”, without which this cake would not be a true Bloomingdale’s cake. The cake was demolished, with my boss scraping the cake round for the remains…The same thing happened with my Bailey’s cheesecake last year, only it was someone else scraping the cake round for the remains. I also seem to be gaining a reputation at work for being the girl who bakes. Making friends through baking…what a novel idea. 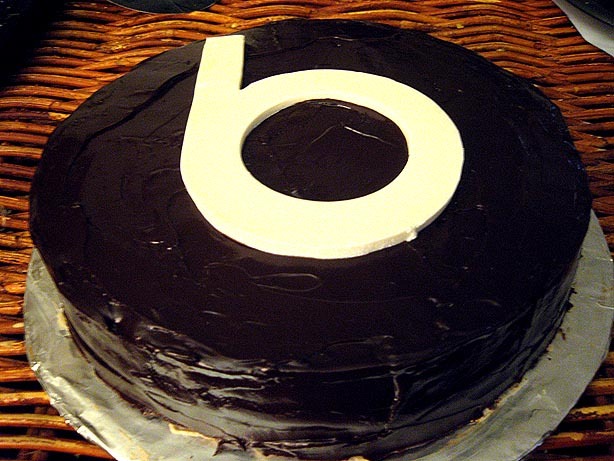 this cake / post title is amazing / hilarious. also, i just made a flourless chocolate cake for the first time ever, this weekend. i ruined it (according to some) by adding basil.